Here is the latest video from South-Tek Systems featuring the patented BeerBlast™ Mixed Gas Dispense System. Please enjoy the video and let us know if you have any questions! Feel free to leave a comment or contact South Tek Systems directly. You can view more videos from South-Tek Systems at our YouTube Channel for Nitrogen Generator Equipment Videos. The WineLast™ Wine Bottle Nitrogen Purging System is designed for the restaurant and bar industry to serve wine from various bottles while preserving the flavor and freshness of the wine in each bottle until you serve the next glass. Any establishment that serves a selection of wine by the glass understands the issue of keeping wine fresh. You don't want to open a bottle to serve one glass, then have the bottle sit and the remaining wine become stale. Once you open a bottle, air interacts with the wine, causing it to oxidize and quickly become stale. While it's good for some wines to decant and be exposed to air before drinking it, it's not good to have that wine exposed to air overnight or for days. Therefore, to protect the freshness of the wine in each opened bottle, you want to prevent prolonged exposure to air. The WineLast™ works by displacing the oxygen laden air in the wine bottle with a Nitrogen purge. The system conveniently mounts under your bar and allows you to keep wine fresh longer by purging with Nitrogen for 2-4 seconds before re-corking the bottle. For more details about the WineLast™ product for restaurants and bars, please refer to our Wine Bottle Nitrogen Purging Product Guide. Please be sure to contact the South-Tek Systems team with any questions you may have about the WineLast™ or the BeerBlast™ Mixed Gas Dispense System for pouring draft beer. South-Tek Systems specializes in engineering and manufacturing Nitrogen Generators to help industries - from the military and federal government to your local restaurant and auto service center - save money by generating their own Nitrogen gas on-site. In fact, businesses can reduce their gas costs by up to 90% using our Nitrogen Generators. And we manufacture a wide range of styles and sizes to meet the needs of almost any industry requiring Nitrogen gas for their process applications. From the N2-Series Nitrogen Generators to the TireBlast™ Nitrogen Tire Filling System, industries have the potential to save money simply by producing Nitrogen from the air we all breathe using our Nitrogen generating products. Purchasing a South Tek Systems Nitrogen Generator is an investment that pays itself back quickly and will save you valuable time and money over the long term. No more running out of Nitrogen gas while waiting on your next liquid or bulk delivery. No more paying 3rd party manufacturing and delivery fees. Restaurants and Bars serving draft beers can really benefit with increased profits by installing the patented BeerBlast™ Mixed Gas Dispense System. This system generates Nitrogen gas onsite and then blends it with CO2 to create the optimal beer gas blend for delivering properly carbonated beer to the tap. This is a key element to serving a quality draft beer and keeping your customers happy and coming back for more! Give us a call and we'll be happy to talk with you about the cost saving benefits of the South Tek Systems Nitrogen Generators: 888-526-6284. 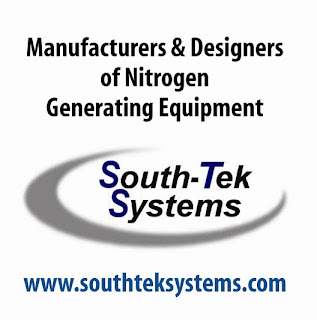 Welcome to the official Blog for South Tek Systems, designer and manufacturer of Nitrogen Gas Generators. We are a proud GSA Contract Holder and you can find a variety of our products at GSA Advantage online. Our gas generation technology uses either PSA or membrane design to ensure the most cost effective solution for your application needs - from military and industrial, to draft beer and beverages served at restaurants and bars, to tire inflation and automotive needs. Whatever your industry and whatever your gas generation needs, South Tek Systems can engineer a solution that's just right for you. Contact us today at 888-526-6284.